Father's Day is extra special when you're a first time dad to an adorable baby girl. 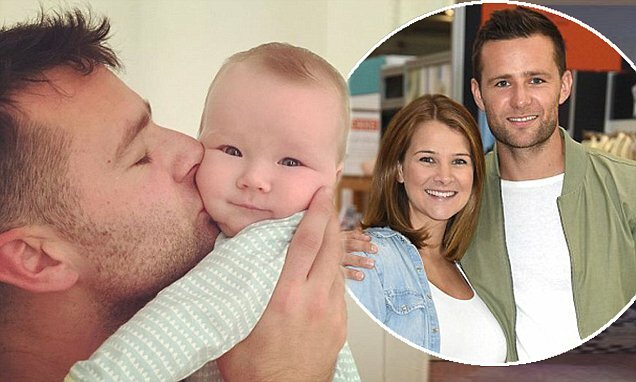 And Harry Judd couldn't contain his pride as he raised his five-month-old daughter Lola to give her a kiss on her cherubic cheeks on Sunday. Another cute snap shared just hours earlier saw Lola donning a lovable sleep suit with 'Apple Of Daddy's Eye' written on it - proving his musician wife Izzy Judd, 32, really had pulled out all the stops for the special day. Harry met his wife, a former violinist with Escala, when she appeared as part of the string section on McFly's 2005 concert tour and they were married in 2012. During an interview with Hello! magazine earlier this year, the heartthrob opened up about how it feels to be a father after a long battle with IVF. Harry added: 'Everything we went through was worth it because it has brought us to this moment. IVF is just mind-blowing and such an amazing thing to give us this family. 'You are just floating in a cloud of love. Our wedding day was the best day of my life and this was a similar feeling, but times 10. These pics are very good looking. These pics are very well off. Beautiful little girl and a beautiful place. These pics are very good student.